For consumers, some of whom may have already lost the doctor when their pre-ObamaCare coverage was canceled, the lack of physicians in a provider network can be a headache. Unfortunately, it is commonplace as a result of the law. The Leonard David Institute of Health Economics and the Robert Wood Johnson Foundation looked at Silver plans available in all 50 states and the District of Columbia in 2014 and compared the provider networks available. Researchers found several states that had a high percentage of ObamaCare plans with limited physician networks, defined as 25 or fewer doctors available on the network. 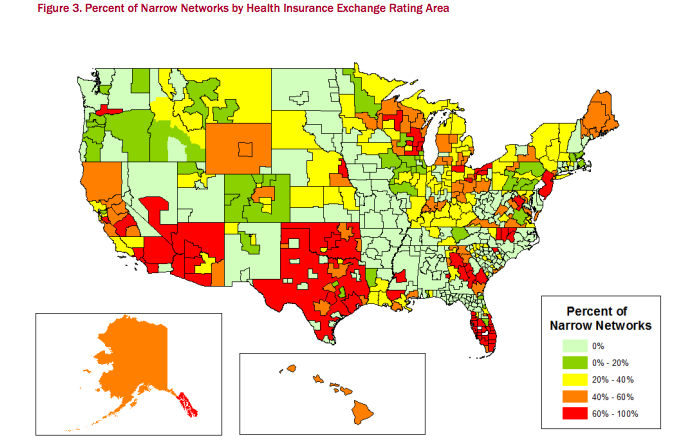 At 83 percent, Georgia had the highest number of plans with narrow physician networks. Florida and Oklahoma followed behind, at 79 percent and 78 percent, respectively. In California and Arizona, more than 70 percent of plans had narrow physician networks. In total, 16 states exceeded 50 percent, while 13 did not have any plans with narrow networks. "In the new health insurance marketplaces, insurers have limited options for offering plans at different price points within a metal tier. ACAmandated changes — such as community rating, standardized benefits, and removing limits on annual or lifetime benefits — mean that insurers must find other strategies for offering lower-cost plans," the brief explains. "Narrow provider networks have emerged as one of the only remaining pieces in the insurers’ cost-containment toolbox." This is not a new phenomenon. Limited networks were noticed not long after the first ObamaCare open enrollment period began in October 2013. Polling conducted not long after suggested that consumers were not keen on the idea of lower premiums as a trade-off for limited networks. As the brief notes, the practice is not transparent, and that probably will not change. "it is difficult for regulators to judge the adequacy of the provider network, something that the ACA requires. The federal standards require networks to have sufficient numbers and types of providers to deliver services without 'unreasonable delay,' though 'unreasonable' is left to the states to define," the brief notes. "According to the Commonwealth Fund, states vary in the standards they set based on maximum travel times, appointment wait times, provider-to-enrollee ratios, or extended hours required. The data challenges also make enforcement of these regulations a challenge for regulators." Insurers have used this practice before, but the market is much different now with ObamaCare. Because of costly provisions of the law, insurers have had to rely on narrow networks more to stay competitive in the marketplace. It is just another problem with ObamaCare, which have piled up on consumers, but it is one that cannot simply be "fixed" through a legislative tweak. Real alternatives are needed to replace ObamaCare with the relationships of consumers and their doctors in mind. NO KIDDING! Because of the economy and the scarcity of local jobs I was forced to sign-up for Obamacare last December. I was lucky to find a GP who was not "filled-up" with such patients after a 2 month search for ANY physician with an opening for this form of "Government Cheese".